Suggested Use: 4 to 6 capsules daily in divided doses or as directed by a health care professional. Oregano and other medicinal mint species have antioxidant properties which are now known to be due in large part to rosmarinic acid (RA) — a compound with proven medicinal value and well-characterized physiological functions. As an effective antioxidant, rosmarinic acid prevents cell damage caused by free radical reactions — reactions that are thought to be involved in inflammation, degenerative arthritis and the aging process in general. RA’s antimicrobial, antiviral, anti-inflammatory and antioxidant qualities have turned it into a useful nutritional supplement. lowering LDL levels — oxidized LDL is a primary instigator of arterial plaque formation. 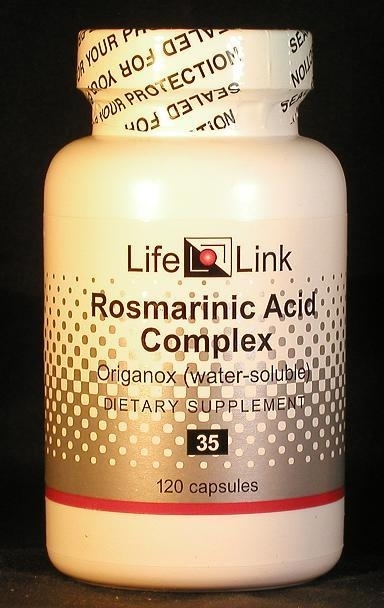 In order to enhance this product’s anti-cancer and cardiovascular-protective actions, LifeLink’s Rosmarinic Acid formulation includes Grape Seed Extract — a source of antioxidants called OPCs, which have somewhat different properties than rosmarinic acid itself. Oregano (Origanum vulgare) and other medicinal mint species have antioxidant properties which are now known to be due in large part to rosmarinic acid (RA) — a compound with proven medicinal value and well-characterized physiological functions. As an antioxidant, rosmarinic acid prevents cell damage caused by free radical reactions — reactions that are thought to be involved in inflammation, degenerative arthritis and the aging process in general. RA’s antioxidant activity is high — superior to that of vitamin E and BHT, for example. Rosmarinic acid is categorized as a ‘plant phenolic’ and is found in a great variety of plants besides oregano and rosemary. Plants such as sanicle, gypsywort, water horehound, lemon balm, the mints, marjoram, and sage contain rosmarinic acid in large amounts — more than 3%, based on dry weight. It is thought that these plants use RA as a defense compound against pathogens and herbivores. Because it has antimicrobial and antioxidant qualities, and because it can be produced in large quantities by extraction from easily cultivated plants, rosmarinic acid has been commercially applied to food preservation — for example, to kill pathogens in sliced meat products. These same properties, plus those of being anti-inflammatory and antiviral, make RA also of interest as a nutritional supplement. It is well absorbed from the gastrointestinal tract and from the skin. Rosmarinic acid shows promise as a preventative for atherosclerosis (the deposition of cholesterol-rich plaques in the artery walls) because RA and other polyphenols prevent the oxidation of LDL (low density lipoprotein), and oxidized LDL is a primary instigator of plaque formation. Furthermore, this inhibition of LDL oxidation is synergistically enhanced by combining RA with certain other nutritional supplements, such as lycopene.